His new track “Rollin Like A Dummy” is the work of an expert YouTube comber. 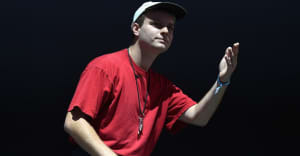 Mac DeMarco is an everyman. He loves music and Youtube. Turns out he does both things really well! The Montreal-via-Edmonton artist leaked a new recording called “Rollin Like A Dummy” to a Mac DeMarco subreddit, because "everybody's always asking for a recording of this song." An appearance on his own Reddit community as a Star Wars character isn't Mac's most left-field use of the internet by far. For a time, he trawled the internet for YouTube videos and saved them to his personal account (which he also uses to upload his own bizarre shorts) It hasn't been updated in awhile—a number of the videos have been deleted or made private—but what was the king of slacker-rock searching for when he was active? Fetish videos, covers of his own songs, bad tutorials, and even music. Watch a selection below and head here for the full experience (NSFW).